Metallo (John Corben) is a comic book supervillain and cyborg who appears in Superman stories published by DC Comics. Metallo's trademark is his kryptonite power source, which he often uses as a weapon against Superman. His traditional identity is John Corben. The character first appeared in Action Comics #252 (May 1959). In 2009, Metallo was ranked as IGN's 52nd Greatest Comic Book Villain of All Time. Abilities: Cyborg body, Kryptonite power source. Unusual Features: Cybernetic replacement for certain and later all body parts. after he discovered the ship that brought the infant Kal-El to earth and mistranslated a message from his father Jor-El to his son. Vale took the helpless Corben to his lab and transplanted his brain into a cyborg body powered by a chunk of Kryptonite, a material deadly to Superman, and, awakening the cyborg, instructed him to kill Superman. Metallo (named after the alloy his new form was made from) was enraged by what Vale had done to him and broke the Professor's neck, killing him, but nonetheless ended up battling Superman. Defeated, he was abducted by Lex Luthor, who realized that his Kryptonite 'heart' was immensely valuable and casually ripped it from his chest, seemingly killing Metallo. teammates the Doom Patrol. As Robotman was using Metallo's modified components at the time, Metallo was able to mentally control Robotman's body. Superman learned of the incident and flew to Kansas City to aid the Doom Patrol. During the fight, Celsius and Scott Fischer combined their powers to destroy Metallo's physical body. His head remained intact however, but went missing amidst the debris. Lex Luthor tracked Metallo down and sent a team of scientists to recover his brain. Luthor's lead scientist Sydney Happersen found Metallo's head and secured it within a crate where it remained locked up inside of a Missouri warehouse for months. Some time later, the alien conqueror known as Brainiac began systematically taking control of all of Lexcorp's facilities. The physical body housing his mental consciousness was dying, so he performed a comprehensive analysis on all of Lexcorp's advancements in cybernetics. Through this, he learned of Metallo and had his head brought to a laboratory where it was attached to a new robotic body. Metallo agreed to work with Brainiac, since he still held a grudge against Luthor. He sent a robot duplicate of himself to stage a robbery at the Lexcorp owned Metropolis Mercantile Bank, knowing that it would draw the attention of Superman. While Superman dealt with the decoy Metallo, the real Metallo led a robot army on a raid against the Lexcorp Tower. Immediately thereafter, Brainiac had Metallo adopt a human disguise and kidnap a scientist named Dr.
Reginald Augustine. Augustine was once one of the founding fathers of the Cadmus Project. With Augustine in tow, Metallo raided Project Cadmus to steal their cloning technology for Brainiac. 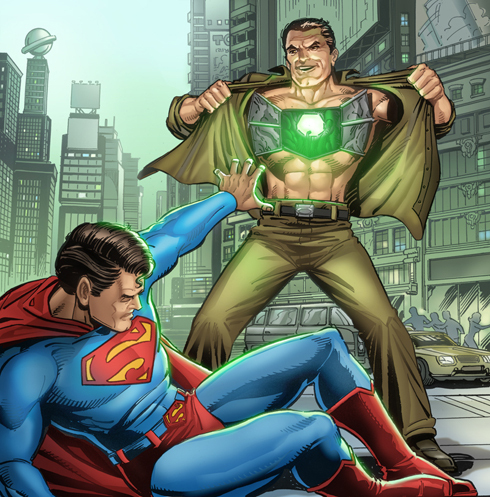 During the raid, Metallo ran afoul of Superman, as well as Cadmus' resident protector, Guardian. He succeeded in procuring the technology required to clone Brainiac a new humanoid body to replace his dying borrowed form (prior to cloning, Brainiac's consciousness occupied the body of former carnival mentalist Milton Fine). A short time later, Metallo encountered Superman again and suffered a resounding defeat. His body was destroyed, and his head was placed under special quarantine at Stryker's Island Penitentiary. Metallo's imprisonment was short lived however. A man named Steelhawk gassed the special detention wing at Stryker's and liberated Metallo's head. In exchange for outfitting him with a larger, sturdier body, Metallo agreed to accept a contract hit on behalf of Steelhawk and his employers. He traveled to Nathan B. Forrest High School in Marietta, Georgia to sanction a teenage boy named Grant Emerson. He smashed through the wall of the classroom and quickly located Emerson, but the incident sparked Emerson's Meta-gene and the young boy increased in size and power. After fighting for several minutes, Grant Emerson's body erupted with power causing a massive explosion that destroyed Metallo's body as well as his entire school. Conduit freed Metallo from S.T.A.R. Labs and had him attack Superman, part of an effort by Conduit to wear down Superman (and distract him as Conduit went after his family). 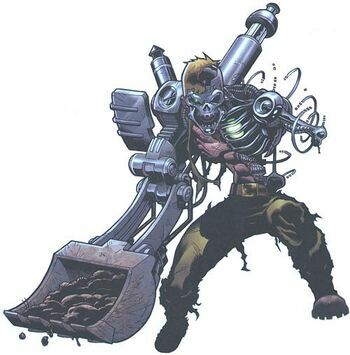 Metallo's new body featured a device that made him unmovable so long as he had his feet planted. Superman fought him outside Metropolis, arriving at a shopping mall. Metallo made the mistake of climbing on top of a car. When Superman kicked the car out from under him, Metallo went airborne and Superman was able to grab him and knock his head clean off. Superman could not wait for him to get picked up, but some local teens promised to watch it (and suggested soccer). When the demon Neron manifested his corporeal form on Earth, Metallo was one of dozens of super-villains who accepted an offer of power in exchange for his immortal soul. Neron granted Metallo greater flexibility and range with his powers, enabling him to morph his body into more complex mechanical constructs--Metallo could now draw on any metal nearby to create a new body for himself, fulfilling a dream to never be rendered "just a head" again. During the "Underworld Unleashed" event, Metallo teamed up with Gorilla Grodd in an effort to hijack a truck carrying nuclear warheads. Batman, Robin and the Huntress arrived in time to prevent the theft, and Metallo escaped. During the ensuing chaos, Metallo arrived in Washington, D.C. where he encountered Steel. Steel was trying to diffuse a riot and had little patience for Metallo. He managed to knock his head off and send it into the Potomac, but Metallo recovered and came back for more. Steel had meanwhile responded to a bomb threat at a mosque. He took the bomb and started to fly out to sea, only to be spotted and pursued by Metallo. When he got close enough, Metallo pulled the bomb to himself, believing he could then be in total control of it. Unfortunately for him, while the casing was metal, the bomb itself was plastique. Metallo's huge frame absorbed most of the blast, although the shockwave still knocked Steel from the air. Metallo would come back to Metropolis, this time when the Man of Steel was in his "Man of Energy" phase. Still unused to both his own new powers as well as Metallo's, Superman was initially only able to battle him to a standstill. Fortunately for Superman, the Ray arrived and helped him understand and use his new powers. Working together, they were able to defeat the cyborg, but Metallo eluded capture. Making his way to the nearby naval base, Metallo managed to convert an entire aircraft carrier into a new body. Superman defeated him soundly this time around, using his powers to drain off the carrier's nuclear energy--a move that nearly proved to great for even Superman. Metallo is taken into custody. Metallo was placed in the orbiting Stryker Prison facility. When General Zod of Pokolistan changed the sun to red and seized the White House, President Lex Luthor rescued a stranded Superman and took them to Stryker's. Metallo removed the armor Zod had placed around Superman. Like many of the other villains, he questioned why he should bother helping Luthor or Superman save the world from Zod. Nevertheless, he did agree to help. While Superman lead a cadre of villains to Earth, Metallo transformed himself into a new colossal spaceship. With Luthor at the "helm," they flew towards the sun to disable the "solar converters" Zod had placed around it. They were attacked by Ignition, but Metallo split his body up into several drones. They successfully destroyed the converters, enabling Superman to defeat Zod back on Earth. Metallo returned Luthor to Earth, and while it is not clear exactly what occured next, Luthor made it clear that he did not pardon at least the other prisoners. John Corben was a sergeant of the regular Army of the United States, and one of the best soldiers under the command of General Sam Lane. Lane made no secret of the fact that he wanted Corben to marry his daughter Lois, much to the dismay of Lois herself. When Superman appeared in Metropolis, Lane went to Luthor and, citing the national security implications of beings like Superman and the Parasite being at large, agreed to help fund a plan to stop him-a battlesuit, composed of Luthor's proprietary 'Metallo' material, and powered by a lump of a strange, glowing green rock. Corben volunteered to pilot the suit. However, in his first encounter with Superman, a stray bullet hit the rock, leading to a disastrous energy surge in the suit, which almost killed Corben. Luthor saved Corben's life by literally integrating him into the suit, transforming him into the cyborg Metallo, with the Kryptonite rock functioning as his new 'heart'. Metallo subsequently attacked Superman again in a rampage which endangered not only the citizens of Metropolis but his own fellow soldiers. He was defeated by Superman once more. Metallo has since come into the employ of Project 7734, the secret American military office that targets alien, and specifically Kryptonian, threats. Alongside Reactron, he is one of their primary offensive assets. 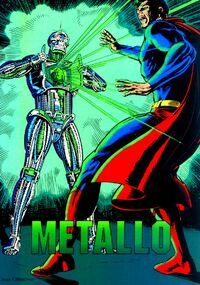 Matter Absorption: Metallo could assimilate volumes of metal into his body in order to maintain a desired physical size. Mechanokinesis: Metallo could control any and all robotic technology not already possessed or in action. He was able to use this ability in conjunction with her matter absorption ability to create an army of robotic clones to attack with. Metamorphosis: Metallo could transform his physical body into any form he wished. His only limitation was the quantity of mechanical mass available to him. Superhuman Strength: Metallo's strength level is augmented by his cybernetic components. Energy Projection: Metallo could fire kryptonite radiation from his eyes or heart at will. Metallo has superhuman strength, the limits of which seem to fluctuate depending upon which upgrades he is using at any given moment. In his first iteration, Metallo was able to lift (press) approximately ten tons. Metallo's brain is one of the few biological components left in his body, and as such, represents his only true vulnerability. So long as his brain is intact, Metallo will always be able to generate a new body for himself.